One on one or small group (no more than 6 students per tutor) classes where students and tutors meet twice a week for a total of three hours. Students and tutors are matched depending on their schedules and the student's level of English skills. The basic literacy program is in need of a tutor. If you have the skills or know of someone who does, please contact us through the website or call us at (509) 682-6967. The Rosetta Stone is an independent study time opportunity through a language acquisition computer program that helps students build a foundation of fundamental English vocabulary and essential language structure. We also have a computer and 5 laptops for the students and tutors to use. Sometimes the students use them to access learning web sites on their own and sometimes the tutors use them to enhance their tutoring objectives. 5:30 to 7:00 P.M. They are designed to give students an opportunity to practice their English-speaking skills and complement tutor-led sessions. 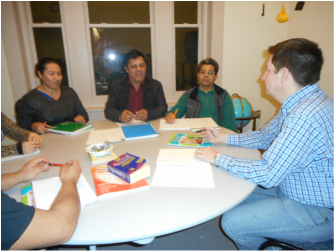 Two 12-week Citizenship classes usually held in the Fall and Winter and designed to prepare permanent residents to become citizens. The course is delivered in English. Students study the 100 Civics questions, and the reading and writing English vocabulary necessary to successfully pass the Citizenship interview process. All volunteers attend an orientation and a new tutor training as part of the support the Literacy Council provides to ensure that their experience is and remains positive. Training is offered at no cost to the volunteer. “The biggest thing besides great personal satisfaction is the constant reminder that we are all very much the same at heart.” Don Bottoms, Literacy Council volunteer tutor and board member. The Literacy Council collaborates with businesses to bring classes to their employees at their place of work. Ease of access facilitates attendance. Emphasis is placed on work-related vocabulary and sentences while basic communication skills are developed and honed.